"I dare say that the [Sri Lankan] government has no right to rule our people as it has failed to provide assistance to hundreds of thousands internally displaced who have been languishing in refugee camps and welfare centres to return to their lands and resettle," said the Tamil National Alliance parliamentary group leader, Mr.R.Sampanthan, addressing a meeting in Kanniya village Monday morning. The meeting followed the laying of foundation stones for the NECORD funded construction of pre-school and multi-purpose hall for the resettled villagers. Mr. Sampanthan further said, "Internally displaced families are currently getting some assistance because of international agencies and local non-governmental organizations. The contribution by the government in this regard is absolutely nil. This clearly shows that the government is not really interested in the welfare of the Tamil people. The government should take note of this." 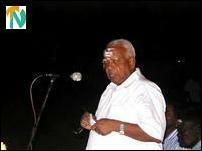 Because of the partisan attitude towards Tamil people by the government in power, the Liberation Tigers of Tamil Eelam has submitted its Interim Self Governing Authority(ISGA) proposal to the then government in October last year to rebuild our homeland and to rehabilitate our Tamil people thus ensuring the return of normalcy in their lives, said Mr.Sampanthan.
" We cannot allow the injustice to Tamil people to continue unabated anymore. We must put a stop to the sufferings of Tamil people. We need international assistance to resettle our internally displaced families. For this, we need the ISGA for the province to provide better life to our people who have been suffering due to the two decade old war. There will not be any salvation for our people without a self-rule proposed in the ISGA," said Mr.Sampanthan. Colombo rulers cannot deny for long the justice to Tamil people. They should come forward to provide justice to our people. Otherwise we would get our just demands by other means, stressed Mr.Sampanthan. Trincomalee district parliamentarian Mr.K.Thurairetnasingham said IDPs are resettled in their villages after several years without basic facilities. NECORD Deputy Project Director Mr.N.Puhendran said Kanniya was the first of twelve villages selected in the Trincomalee district under the Community Rehabilitation Development project. The NECORD has paid about 1700 million rupees for around 68,000 families at the rate of 25 thousand rupees to each family. The LTTE Trincomalee district political head, Mr.S.Thilak, commended the NECORD for launching development projects identifying the urgent needs of the resettled villagers. The TRO is also undertaking development works identifying the problems of the villagers. Both institutions have joined hands in developing the war torn village Kanniya, he said. Mr.R.Umakanthan, NECORD District Deputy Project Director, and Mr.K.Mathavarajah, TRO Trincomalee District Director also spoke.